Mountain Tea is enormously popular in ALBANIA,KOSOVO,MONTENEGRO , GREECE,MACEDONIA ,BULLGARIA(BALKAN PENINSULA)TURKEY used For centuries . It is said to have a positive effect on almost anything that ails but, most notably, it is used for colds, respiratory problems, digestion, the immune system, mild anxiety, and as an anti-oxidant. Sideritis of Pedanius Dioscorides (40-90 AD), named after the Greek physician, pharmacologist and botanist who wrote the well-known De Materia Medica, is an herb belonging to a large genus in the family of Labiaceae (the family of minty plants). Sideritis includes more than 150 species, bushes full of small yellow blossoms growing at high altitude in rough, mountainous terrain. In Greece alone, 17 different species are indigenous, extremely fragrant and very productive: Sideritis athoa (growing on Mount Athos), Sideritis clandestina (growing on the especially rough Mount Helmos and Taygetos in the Peloponnese), Sideritis scardica (on Mount Olympus), Sideritis raeseri (on Mount Parnassus), Sideritis syriaca (on the mountains of Crete, known as malotira, pronounced mah-loh-TEER-rah) and Siderities euboea (on the mountains of the Euboea island). 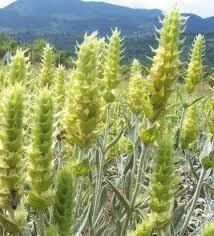 Of these, only one species is cultivated, sideritis raeseri...the rest are all wild. The plant knows other variations throughout the Meditteranean, such as the Sideritis erythrantha of Turkey or the sideritis of Italy. As part of the famous study on the Cretan Diet, it certainly contributes to the health and well-being that Cretans have enjoyed for so long, alongside good wine and virgin olive oil! DRINK on the SUBTLE Side! Full of Flavonoids and Antioxidants In 2011, the “Journal of Ethnopharmacology” published a study on the flavonoid content of all plants found within the Sideritis genus. Despite the wide array of species available -- over 150 -- researchers found that all Sideritis species plants were shown to have anti-microbial, anti-inflammatory, antioxidant and anti-spasmodic properties. They were rich in a number of natural antioxidants, including flavonoids, and almost all species also contained essential oils. Lowers Blood Pressure A 2012 publication of the “Journal of Physiology and Pharmacology” found that extracts made from Sideritis helped lower blood pressure levels while helping blood vessels to relax. The animal study measured arterial blood pressure and found that a dose of Sideritis extract led to blood vessel dilation, which helped lower blood pressure levels and reduced stress on the heart muscle. While the studies helped support the use of Sideritis for its heart health benefits, further research is needed before Greek mountain tea can be considered a treatment for cardiovascular conditions. Protects the Digestive System In 2012, “Planta Medica” published an animal study on the effects of Greek mountain tea on gastrointestinal health and disorders. Researchers found that taking an oral dose of Greek mountain tea led to less inflammation in the gastrointestinal tract, likely due to the presence of phenols and antioxidants found naturally in the plant. Researchers also found that taking the supplement led to reduced inflammation and toxicity in the long term, demonstrating Greek mountain tea’s protective abilities. While the results were promising, further study is needed on Greek mountain tea as an herbal treatment for gastrointestinal complications. Mountain Tea’s Antioxidants The small yellow flowers, leaves and stems of Sideritis are rich in oils and compounds which are known antioxidants. One of these is called kaempherol – a flavenoid with very powerful properties. It has been studied and results indicate that it can be beneficial for a wide range of illnesses (including their prevention) such as leukemia, breast cancer, diabetes and even lung cancer. Presently, this flavenoid is being considered on it’s own as a possible treatment for a variety of cancers. Other compounds with high antioxidant properties in Sideritis include aglycones, chlorogenic acid (cancer preventing compound), verbascoside (anti-inflammatory and antimicrobial), and many others have also been identified. 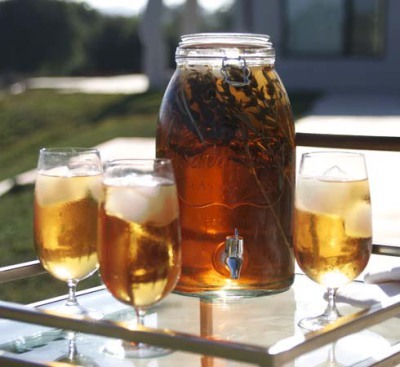 Mountain Tea For Anxiety & Depression Hippocrates recognized that sipping Mountain Tea had a positive effect on anxiety and depression, and again, scientific research is bearing this out to be a true fact. A paper published in the peer reviewed journal Molecules in April 2015 discussed a study in which four flavenoids (xanthomicrol (1), isoscutellarein 7-O-[6”’-O-acetyl-β-D-allopyranosyl-(1→2)]-β-D-glucopyranoside (2), isoscutellarein 7-O-[6”’-O-acetyl-β-D-allopyranosyl-(1→2)]-6”-O-acetyl-β-D-glucopyranoside (3) and salvigenin) found in Mountain Tea were shown to have an effect on inhibiting hMAO in the human brain. Higher levels of hMAO in the brain are associated with several conditions including anxiety, depression, Alzheimer’s and Parkinson’s Disease. In other words, regular consumption of Mountain Tea could help you prevent mental illnesses related to aging while also helping others that have mood disorders not related or specific to any age. If you suffer from anxiety and/or depression, this tea, regularly consumed, may have beneficial effects for you. Mountain Tea & Libido There are some references in older literature that suggests regular consumption of Mountain or Shepherd’s Tea can also have beneficial effects on libido. While there has been little, if any, scientific research in this area, it is quite possible that some of the anecdotal evidence may be correct. With a high content of the minerals potassium and zinc, both of which are necessary for good health including sexual health, drinking this beverage may also help with mineral balance. Additionally, with the anti-anxiety and antidepressant qualities, regular consumption may have an ability to help you “get in the mood” that is more difficult when you are feeling depressed or anxious.